Paced Feeding is a method of feeding a baby in a way that more closely mimics breastfeeding, when a baby feeds more slowly, and works harder to get his milk. This helps prevent overfeeding. If you are wanting to adopt a paced feeding approach with your little one, the good news is that the the award winning Haberman Suckle Feeder is recommended for paced feeding by lactation consultants as it was designed specifically with breastfeeding in mind. Paced Feeding is a concept which is becoming increasingly spoken about among health visitors and other support networks for new mums. Simply put, paced feeding is a technique that allows the baby to control the feeding session and eat at their own pace. By introducing slow feeding it more closely mimics breastfeeding. 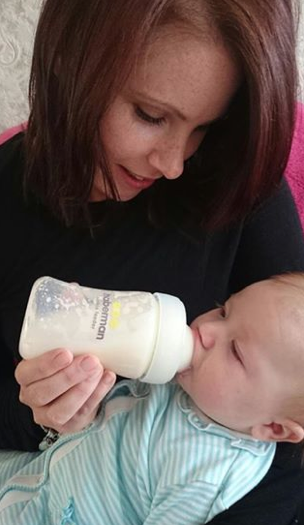 If the baby receives the milk at a faster rate when bottle-feeding than when breast-feeding, it can affect a baby's ability to return to the breast and/or cause the baby to take in too much milk, too quickly. This in turn can lead to the baby being overwhelmed and/or overfeeding. For paced feeding, the baby should be in an upright position. With ordinary bottles, this means that the teat is half full and the baby can ingest air. With ordinary bottles, you have to intermittently tip the bottle down, breaking the baby's lip seal, to pause feeding. This can cause the baby to ingest air. You don't need to do this with Suckle Feeder because the baby controls the flow and mum can regulate it without interrupting feeding. Another good tip is to switch sides during the feeding to mimic feeding at the breast and to even out eye stimulation.